Most New Zealand farmers use fertiliser to boost production and profit. The fertiliser industry promotes the ‘4Rs’ to help farmers get the best value from their fertiliser investment, and to reduce unwanted environmental impacts. The 4Rs of fertiliser use are the right source, right rate, right time and the right place. 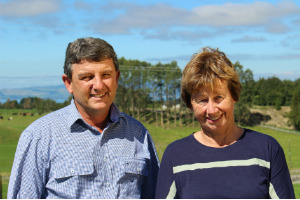 Dairy farmers Chris Haworth and Chris Steven’s talk about their fertiliser practices. On-screen 4Rs text: Right product, rate, place & time Most New Zealand farmers use fertiliser to boost production and profit. The fertiliser industry promotes the ‘4Rs’ to help farmers get the best value from their fertiliser investment, and to reduce unwanted environmental impacts. The 4Rs of fertiliser use are the right source, right rate, right time and the right place. Today we are at Chris Haworth and Chris Steven’s 225 hectare dairy farm just north of Rotorua. We bought Tawa Ridge in 1992. Today we milk 520 cows at about 2.3 cows per hectare. We have several areas of native bush and a large DoC reserve on our boundary. A tributary of the Mangorewa Stream borders the farm, but only flows occasionally. This area has been fenced off and retired. About three years ago we signed up to the GPS based Precision Farming tool. This technology helps us farm more efficiently, especially when it comes to fertiliser. In the past we noticed that a few paddocks got double fertiliser applications while other areas missed out completely. We also want to keep fertiliser away from the bush areas and stream margins. With this tool you can watch the fert truck movement in real time on our office computer [‘Right place’ on screen text]. The trucks are Spreadmark certified which means the spreaders are regularly calibrated to apply fertiliser evenly and with a consistent width. We automatically receive electronic ‘proof of placement’ for each fertiliser application. The software sums up each nutrient applied to each paddock. That allows us to put the annual N P K and S totals into our nutrient budget for Fonterra. The subscription based system is entirely computer based, making it much easier to manage than folders full of paper. This gives us confidence that the right amount of fertiliser is placed in the right place – everything is traceable and accountable. The right rate of fertiliser is about meeting pasture and crop nutrient requirements. This is true for the big four nutrients – nitrogen, phosphorus, potassium and sulphur – as well as micro-nutrients like selenium and cobalt. We are thinking about applying different fertiliser mixes to different paddocks and the tool help us with that too. We buy ‘Fertmark’ approved fertiliser from Ballance Agri-Nutrients. Fertmark is a quality assurance scheme owned by New Zealand farmers. That means the fertiliser is guaranteed to have the nutrient composition we need and the right physical properties like particle size. The right timing is about applying fertiliser to match seasonal plant and animal growth needs. We avoid applying fertiliser when plant uptake is poor like in winter. As well as being inefficient, there is a greater risk of nutrient losses in winter. We generally apply fertiliser a little and often, especially for K and S which are easily leached on our pumice soils. In autumn, we wait for soil moisture levels to rise before applying nitrogen. The Haworth-Stevens pay about $2000 per year for their Precision Farming tool which includes setting up the digital farm map and software. For an average Rotorua dairy farm, 11% less N fertiliser applied under precision spreading is assumed to produce the same pasture dry matter as under conventional fertiliser spreading. This reduced N leaching by about 2 kg per hectare with a cost saving of about $8 per hectare.